Phosphoinositides, a family of phosphorylated derivatives of phosphatidylinositol (PtdIns), are tightly regulated both temporally and spatially by PtdIns phosphatases and kinases. Mutations in inositol polyphosphate 5-phosphatase E (INPP5E) cause Joubert syndrome, a human disorder associated with numerous ciliopathic defects, including renal cyst formation, linking phosphoinositides to ciliopathies. However, the molecular mechanism by which INPP5E-mediated PtdIns signaling regulates ciliogenesis and cystogenesis is unclear. Here, we utilized an in vivo vertebrate model of renal cystogenesis to show that Inpp5e enzymatic activity at the apical membrane directs apical docking of basal bodies in renal epithelia. Knockdown or knockout of inpp5e led to ciliogenesis defects and cystic kidneys in zebrafish. Furthermore, knockdown of inpp5e in embryos led to defects in cell polarity, cortical organization of F-actin, and apical segregation of PtdIns(4,5)P2 and PtdIns(3,4,5)P3. Knockdown of the ezrin gene, which encodes an ezrin/radixin/moesin (ERM) protein that crosslinks PtdIns(4,5)P2 and F-actin, phenocopied inpp5e knockdowns. Notably, overexpression of the ezrin gene rescued inpp5e morphants. Finally, treatment with the PI 3-kinase inhibitor LY294002, which decreases PtdIns(3,4,5)P3 levels, rescued the cellular, phenotypic, and renal functional defects in inpp5e-knockdown embryos. Together, our data indicate that Inpp5e functions as a key regulator of cell polarity in the renal epithelia, by inhibiting PtdIns(3,4,5)P3 and subsequently stabilizing PtdIns(4,5)P2 and recruiting Ezrin, F-actin, and basal bodies to the apical membrane, and suggest a possible novel approach for treating human ciliopathies. The cilium is a microtubule-based subcellular organelle that protrudes from the cell surface into the extracellular environment and functions as an antenna to detect chemical and mechanical signals. Cilia are found on most cell types in vertebrates and have been associated with numerous signaling pathways, such as SHH, Wnt, EGFR, and others.1 Ciliary dysfunction affects a wide spectrum of different organs and has been associated with a growing list of human disorders coined as ‘ciliopathies’. One such ciliopathy, Joubert Syndrome (JBTS), is an autosomal recessive disease characterized by a unique midbrain-hindbrain malformation, the ‘molar tooth sign’, and various organ defects, including renal cysts, retinitis pigmentosa, polydactyly, and midline oral-facial defects.2 To date, 21 causative genes, all encoding proteins of cilia or basal bodies, have been identified for JBTS.2 However, the role of many of these genes in ciliogenesis and pathogenesis still remains elusive. INPP5E, which encodes the enzyme inositol polyphosphate 5-phosphatase E (INPP5E), is a previously identified causative gene for JBTS.3,4 Biochemically, INPP5E has been shown to hydrolyze the 5-phosphate PtdIns(4,5)P2 and PtdIns(3,4,5)P3, and compromised enzyme activity of Inpp5e is pathogenic.3,5 Strikingly, INPP5E is localized to cilia and this localization pattern is disrupted by several mutations found in human patients.3,4 Although pathogenic mutations in INPP5E do not appear to affect ciliogenesis in cultured cells, ciliogenesis defects have been observed in zebrafish knockdown embryos and cyst-lining renal epithelia in Inpp5e mouse mutants.4,6 Thus, Inpp5e is required for ciliogenesis in vivo and may function in a tissue-specific manner. 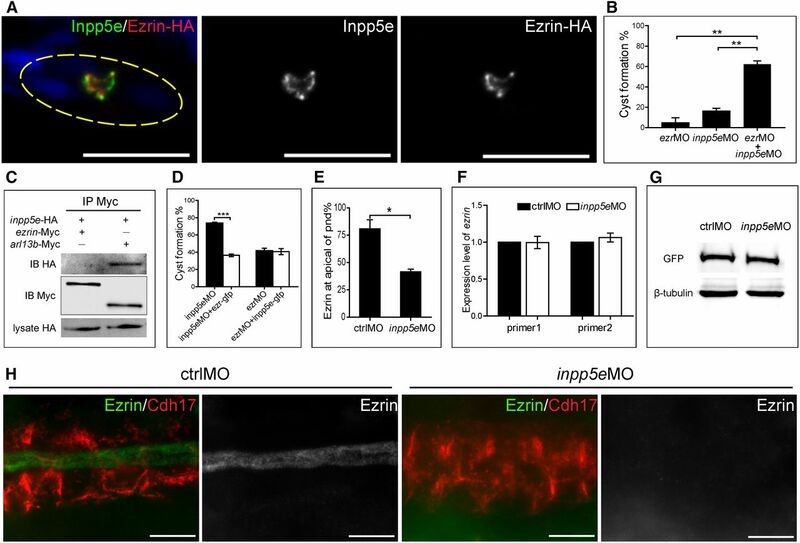 Combined, these results link INPP5E-mediated phosphoinositide signaling to ciliogenesis and suggest that the enzyme activity of INPP5E is essential for its function in ciliogenesis. However, the molecular mechanisms underlying the ciliogenesis function of INPP5E are unclear. A prominent known function of PtdIns(4,5)P2 and PtdIns(3,4,5)P3 is their regulatory role in the actin cytoskeleton.7,8 Interestingly, the actin cytoskeleton is important for ciliogenesis. Chemical disruption of actin assembly results in ciliogenesis defects in different vertebrate systems.9–12 Moreover, proper actin assembly is associated with apical docking of basal bodies, the base of the ciliary axoneme.10,13,14 Furthermore, a recent study has shown that basal bodies are anchored to actin by the ciliary adhesion complex,15 thereby supporting a direct link between actin cytoskeleton and ciliogenesis. Despite these findings, the upstream signals regulating actin assembly, basal body docking, and subsequent ciliogenesis are still unclear. We hypothesize that INPP5E may influence ciliogenesis by regulating actin assembly and basal body docking through PtdIns(4,5)P2 and/or PtdIns(3,4,5)P3. To test this hypothesis, we investigated the phenotypes of inpp5e knockdown or knockout embryos in zebrafish. Depletion of Inpp5e in zebrafish leads to kidney cysts and ciliogenesis defects. Moreover, we provide evidence that by hydrolyzing PtdIns(3,4,5)P3 and sequentially stabilizing PtdIns(4,5)P2, Inpp5e recruits Ezrin, F-actin, and basal bodies to the apical membrane. Together, these results strongly support our hypothesis. Finally, we show that phosphoinositide 3-kinase (PI3K) inhibitor can suppress the phenotypes of inpp5e knockdown animals, suggesting a new approach to treat human ciliopathies. To tease out the role of inpp5e during embryonic development, we first examined the expression pattern of inpp5e transcript and subcellular localization of the protein in zebrafish embryos. In situ hybridization showed that inpp5e was maternally expressed and detected in ciliated organs, including the pronephric duct (pnd), otic vesicle, olfactory vesicle, and eye (Supplemental Figure 1, A–F). Both overexpression and immunostaining results showed that Inpp5e was localized to the apical membrane as well as basal bodies, but not cilia, in the pronephric epithelium in zebrafish (Figure 1A, Supplemental Figure 1, G–I). The immunostaining with Inpp5e antibody was mostly negative in inpp5e mutants (Figure 1, A–B), supporting the specificity of the antibody. Interestingly, Inpp5e was localized to cilia in the epithelia of neural tube or adult kidney (Supplemental Figure 1, J–N), indicating that Inpp5e localization was temporally and spatially regulated. Cystic kidney and cellular defects caused by knockout or knockdown of inpp5e. In (B and C), lateral view; in (A and E–I), cross-sections of pnd area. In (A–I), ctrl siblings (A, C, and D) or ctrl morphants (E–I) are on the top rows and inpp5e mutants or morphants on the bottom rows. Embryos in all panels are at 72 hpf except those in (G), which are at 24 hpf. Yellow dotted circles indicate the pnd area from cross-sections. (A) Representative image of ctrl siblings and inpp5e mutants stained with antibody against the basolateral marker Na+/K+ ATPase (α6F) and Inpp5e. (B) Bar graph of percentage of positive Inpp5e staining in pnd. Positive was counted when Inpp5e signal at apical pnd was visually obvious on the screen. N=2, n≥20 (C) Representative image of ctrl siblings or inpp5e mutants. Insets show magnification of glomerulus area in the black-boxed region in the main figure. Note the kidney cyst in Inpp5e mutant. (D) Representative image of ctrl siblings (100%) and inpp5e mutants (100%) stained with antibody against the apical marker aPKC and ciliary marker acetylated tubulin (N=2, n≥6, P<0.005). (E-G) Representative image of ctrl morphants and inpp5e morphants stained with antibody against aPKC and Na+/K+ ATPase (α6F) (n≥15 embryos pooled from two independent experiments) (E), or γ-Tub (n≥10 embryos pooled from two independent experiments) (F), or acetylated tubulin (green) and the probe for F-Actin Rhodamine-Phalloidin (100% in both ctrl group and inpp5e morphants group, n=12 embryos pooled from two independent experiments) (G). Yellow arrows indicate apical mislocalization of Na+/K+ ATPase. White arrow and white boxes indicate mislocalization of the basal bodies from the apical side. Insets show magnification of the basal body in white-boxed region in the main figure (F). Arrowheads indicate the mislocalization of F-actin to lateral side in inpp5e morphants. (H, I) Representative images of ctrl morphants or inpp5e morphants coinjected with Tolcdh17:PH-plcd1-GFP plasmid (H), the kidney-specific cdh17 promoter driven PtdIns(4,5)P2 probe, or Tolcdh17:PH-akt1-GFP plasmid (I), the chd17 promoter driven PtdIns(3,4,5)P3 probe, and stained with antibodies against GFP and aPKC. Arrow indicates mislocalization of PtdIns(3,4,5)P3 to the apical membrane. (J) Bar graph shows that apical localization of PtdIns(4,5)P2, indicated by apical fluorescent intensity of PH-Plcd1-GFP, is significantly reduced in pnd of inpp5e morphants (N=2, n≥12 cells from four embryos). (K) Bar graph shows that apical mislocalization of PtdIns(3,4,5)P3, indicated by apical fluorescent intensity of PH-Akt1-GFP, is significantly increased in inpp5e morphants (N=2, n≥15 cells from four embryos). Error bars, SD; **0.005<P<0.01; ***P<0.005. N indicates number of independent experiments and n indicates sample size in each group, usually the number of embryos used, unless otherwise stated. Scale bar, 10 μm. We then used a previously described translation-blocking morpholino (MO) to knock down inpp5e.6 Downregulation of inpp5e resulted in cystic kidneys, which were rescued by overexpression of human INPP5E-gfp mRNA (Supplemental Figure 2, A–B), supporting the specificity of the inpp5e MO.6 However, overexpression of pathogenic forms of INPP5E, INPP5E-R378C or INPP5E-R512/515W, both of which have compromised enzyme activities but normal localization patterns,3 failed to rescue inpp5e morphants (Supplemental Figure 2, B–C), demonstrating that 5′-phosphatase activity is required for normal function of INPP5E. To validate the phenotypes of the inpp5e morphants,16,17 we used the clustered regularly interspaced short palindromic repeats (CRISPR) system18–20 to generate an inpp5e mutant. Indeed, inpp5e−/− showed curved body axis, cystic kidney, and ciliogenesis defects (Figure 1, C–D, Supplemental Figure 3), verifying the specificity of these defects observed in inpp5e morphants (Supplemental Figure 4, A–B). Apicobasal cell polarity, with the apical membrane facing the lumen and the basolateral membrane connecting to neighboring cells or the extracellular matrix, is important for normal kidney physiology and defects in this process have been implicated in several cystic kidney disease models.21,22 Interestingly, in inpp5e morphants, Na+/K+ ATPase, a basolateral marker, was ectopically localized to the apical plasma membrane, but an apical marker, a-PKC, remained normal (Figure 1E). Apical recruitment and docking of basal bodies is crucial for proper cilia assembly and defects in cell polarity could compromise this process.13,14 Basal bodies were partially colocalized with the apical membrane marker, aPKC, in ctrl morphants (100%) but not in inpp5e morphants (8%, Figure 1F), indicating that apical docking of basal bodies was disrupted in inpp5e morphants. Notably, this process was normal in ciliary and cystic mutants ift172hi2211 and ift57hi3417 (Supplemental Figure 5),23 suggesting ciliogenesis has little impact on basal body docking and that Inpp5e affects this process through a more direct mechanism. As cortical organization of F-actin is critical for apical docking of basal bodies and for ciliogenesis,13,14 we examined F-actin organization in inpp5e morphants. In contrast to its apical localization in control morphants, F-actin was decreased from the apical side and enriched toward the lateral sides in pronephric epithelium in inpp5e morphants (Figure 1G). Together, these results indicate that Inpp5e functions through apically recruiting F-actin and basal bodies to control ciliogenesis during renal development. Previous studies have shown that PtdIns(4,5)P2 and PtdIns(3,4,5)P3, two substrates of Inpp5e, are segregated at the apical side of epithelium and play critical roles in determining apicobasal polarity.24,25 We asked whether Inpp5e controlled apicobasal polarity by regulating apical segregation of PtdIns(4,5)P2 and PtdIns(3,4,5)P3 in the kidney. To test this hypothesis, we utilized two probes, GFP-tagged pleckstrin homology (PH) domain of phospholipase Cδ1 (PH-Plcd1-GFP) and of Akt1 (PH-Akt1-GFP), driven by the kidney-specific cdh17 promoter, to detect the localization of the PtdIns(4,5)P2 and PtdIns(3,4,5)P3.25 PtdIns(4,5)P2, indicated by PH-Plcd1-GFP, was enriched on the apical side of pronephric epithelium in control morphants, but failed in inpp5e morphants (Figure 1, H–J). In a complementary fashion, in control morphants PtdIns(3,4,5)P3 was absent from the apical side of pronephric epithelium in control morphants, whereas it was ectopically localized to the apical membrane in inpp5e morphants (Figure 1, I–K). Furthermore, the intensities of apical PtdIns(4,5)P2 and PtdIns(3,4,5)P3 were negatively correlated (Supplemental Figure 6), indicating that these two molecules affect each other. As PH-Akt1 recognizes both PtdIns(3,4)P2 and PtdIns(3,4,5)P3, the ectopically apical localization of PtdIns(3,4,5)P3 in inpp5e morphants was further confirmed by another specific PtdIns(3,4,5)P3 probe, PH-Btk-GFP (Supplemental Figure 4, C–D)26. We also observed that the catalytic domain of PI3K, p110α, was localized to the basolateral side in control embryos whereas it was ectopically localized to the apical side in inpp5e mutants (Supplemental Figure 7, A–B), further supporting the ectopic localization of PtdIns(3,4,5)P3. This result also supports a positive feedback loop between PtdIns(3,4,5)P3 and PI3K, which has been proposed in epithelial and chemotaxing cells.24,27 As PI3K converts PtdIns(4,5)P2 to PtdIns(3,4,5)P3, the ectopically localized PI3K could potentially account for the reduced PtdIns(4,5)P2 level in inpp5e morphants. The specificity of the p110α antibody was confirmed by immunostaining in p110α knockout embryos (Supplemental Figure 7, C–D). Combined, these results suggest that Inpp5e depletion disrupted the apical segregation of PtdIns(4,5)P2 and PtdIns(3,4,5)P3 during kidney development. Previous studies have shown that Ezrin functions as a crosslinker between PtdIns(4,5)P2 and Actin, with its N-terminal FERM domain interacting with PtdIns(4,5)P2, and C-terminal ERM-associated domain interacting with Actin.28–32 Interestingly, Ezrin is required for apical docking of basal bodies as well as ciliogenesis in both zebrafish and Xenopus.33 Thus, we reasoned Ezrin might couple apical PtdIns(4,5)P2 to downstream events by regulating cortical actin organization and subsequent basal body docking. To test this hypothesis, we first examined the expression pattern of ezrin in zebrafish embryos. Similar to inpp5e, ezrin was maternally expressed and observed in ciliated organs, including the pnd, otic vesicle, olfactory vesicle, and eye (Figure 2A, Supplemental Figure 8A). In addition, both immunostaining and overexpression results showed that Ezrin was localized to the apical side of pronephric epithelia in zebrafish (Figure 2D, Supplemental Figure 8B). ezrin morphants phenocopy inpp5e morphants. (A–E), lateral view; (F–H), cross-sections of pnd area. Panels (B and D–H), ctrl morphants are on the left and ezrin morphants on the right. Yellow dotted circles indicate the pnd area of cross-sections. (A) Expression pattern of ezrin at 72 hpf of whole embryo (left) and pnd region (right). (B) Representative image of ctrl morphants or ezrin morphants at 72 hpf. Insets show magnification of glomerulus area in black-boxed region. Note cystic kidney in ezrin morphants. (C) Bar graph shows percentage of cystic kidney in indicated group (N=3, n≥70). Error bars, SD; ***P<0.005. (D) Embryos of ctrl morphants or ezrin morphants stained with antibody against ace-Tub and Ezrin. Ezrin staining disappeared in 56% of ezrin morphants (n=16, pooled from two independent experiments). (E) Embryos of ctrl morphants or ezrin morphants stained with antibody against ace-Tub and aPKC show loss of cilia in pnd of 75% of ezrin morphants (n=20, pooled from two independent experiments). (F) Cross-section of pnd from ctrl morphants or ezrin morphants stained with antibody against a-PKC and Na+/K+ ATPase (α6F). Yellow arrow indicates mislocalization of Na+/K+ ATPase (α6F) to the apical membrane in ezrin morphants (100%, n=15, pooled from two independent experiment). (G) Cross-sections of the pnd from ctrl morphants or ezrin morphants stained with antibodies against γ-Tub. Basal bodies are tightly associated with apical lumen in ctrl morphants but not in ezrin morphants (67%, n=12, pooled from two independent experiments), indicated by the white arrows. (H) Cross-sections of the pnd from ctrl morphants or ezrin morphants stained with Rhodamine-phalloidin and antibody against ace-Tub. Yellow arrowheads indicate mislocalization of F-actin to lateral side in ezrin morphants (83.4%, n=12, pooled from two independent experiments). Scale bar: 20 μm in (D and E); 10 μm in (F–H). Knockdown of ezrin, by using a previously described translation-blocking MO,33,34 resulted in cystic kidneys, which was rescued by coinjection of ezrin-gfp mRNA (Figure 2, B–C). In addition, immunostaining showed that Ezrin was lost in ezrin morphants (Figure 2D). Thus, the ezrin MO is both effective and specific. Previous studies have identified two mutants for Ezrin, K253, 254, 262, 263N (4KN thereafter), and R579A, which lose interaction with PtdIns(4,5)P2 and F-actin, respectively.29,35 In contrast to wild-type ezrin-gfp, neither ezrin4KN-gfp nor ezrinR579A-gfp could rescue ezrin morphants (Figure 2C), indicating that both PtdIns(4,5)P2 and F-actin interacting domains are important for the normal function of Ezrin in ciliogenesis and kidney development. Similar to inpp5e morphants, cilia were absent, the basolateral marker Na+/K+ ATPase was mislocalized to the apical membrane, and basal bodies and F-actin were mislocalized in cystic ezrin morphants (Figure 2, E–H, Supplemental Figure 9A). Furthermore, apical PtdIns(4,5)P2 was lost while basolateral PtdIns(3,4,5)P3 was apically mislocalized in ezrin morphants (Supplemental Figure 9, B–D). Altogether, ezrin morphants phenocopied inpp5e morphants in every aspect examined, indicating that ezrin and inpp5e may act in the same pathway. To investigate a potential functional interaction between Inpp5e and Ezrin, we examined whether they were colocalized. Indeed, endogenous Inpp5e was colocalized with overexpressed Ezrin-HA on the apical side of the pronephric epithelium (Figure 3A). We additionally examined genetic interactions between the two genes by synergistic analysis. Coinjection of subphenotypic doses of both inpp5e MO and ezrin MO exaggerated the percentage of cystic kidney compared with single MO injection (Figure 3B), supporting a genetic interaction between ezrin and inpp5e. However, coimmunoprecipitation failed to detect physical interactions between these two proteins (Figure 3C), indicating that Inpp5e does not directly interact with Ezrin. Ezrin acts downstream of Inpp5e. (A) Ezrin and Inpp5e are colocalized on the apical side of pronephric epithelia in 1-dpf old embryos. Localization of Inpp5e is labeled by its antibody while Ezrin is detected by overexpression of ezrin-HA mRNA followed by HA staining. (B) Bar graph shows synergistic effect on kidney cyst formation by mild inhibition of inpp5e and ezrin (N=3, n≥60). (C) Co-IP result indicates that Inpp5e does not physically interact with Ezrin. (D) Bar graph shows that overexpression of ezrin-gfp mRNA can rescue inpp5e morphants but not the other way around, i.e., overexpression of inpp5e-gfp mRNA cannot rescue ezrin morphants (N=3, n≥60). (E) Bar graph shows the significant decreases of the apical localization for Ezrin in the pronephric epithelium in inpp5e morphants at 3 dpf (N=2, n≥15). (F) Bar graph shows qRT-PCR result of ezrin transcript by using two different sets of primers (n=2). Expression level of ezrin is normalized to ctrl morphants. (G) Western blot of antibody against GFP using lysate from embryos injected with ezrin-gfp mRNA in ctrl morphants or inpp5e morphants. (H) Apical localization of Ezrin in the pnd, labeled by antibody against Ezrin and basolateral marker Cadherin17 (Cdh17). Error bars, SD; *P<0.05; **0.005<p<0.01; ***P<0.005. Scale bar, 10 μm. To determine the epistatic relationship between Inpp5e and Ezrin, we carried out a rescue experiment. Strikingly, overexpression of ezrin-gfp mRNA rescued Inpp5e morphants, but overexpression of inpp5e-gfp mRNA could not rescue ezrin morphants (Figure 3D). In addition, ciliogenesis was partially rescued by coinjection of ezrin-gfp mRNA in inpp5e morphants (Supplemental Figure 10). Together, Ezrin functions downstream of Inpp5e. As PtdIns(4,5)P2 was decreased from the apical membrane in inpp5e morphants, we reasoned that the apical localization of Ezrin would be affected. Immunostaining results showed that apical localization of Ezrin was decreased in cystic inpp5e morphants compared with ctrl morphants (Figure 3, E and H). Quantitative real-time PCR results showed that the transcription level of ezrin remained unchanged in inpp5e morphants compared with ctrl morphants (Figure 3F). Furthermore, the stability of the Ezrin protein was unchanged in inpp5e morphants by examining overexpressed Ezrin-GFP (Figure 3G). In summary, apical localization but not the transcription or protein stability of Ezrin was regulated by Inpp5e. As our data showed that knockdown of inpp5e led to ectopic localization of PtdIns(3,4,5)P3 to the apical membrane, we asked whether inhibition of PtdIns(3,4,5)P3 could rescue the phenotypes of inpp5e morphants.24,27 Treatment with 15 μM of LY294002, a PI3K inhibitor, from shield stage showed little effect on normal embryonic development (Supplemental Figure 11, A–D). However, it reduced ectopically apical localization of PtdIns(3,4,5)P3 in inpp5e morphants (Figure 4, D and G). In addition, it partially suppressed cyst formation in inpp5e morphants, but not in ezrin morphants (Figure 4, A and G, Supplemental Figure 11E), indicating that PtdIns(3,4,5)P3 acts downstream of Inpp5e but not Ezrin. Furthermore, it partially restored ciliogenesis, apical localization of PtdIns(4,5)P2 and that of Ezrin in inpp5e morphants (Figure 4, B, C, E, and G). Taken together, these data suggest that decreasing PtdIns(3,4,5)P3 by LY294002 rescued cystic kidneys in inpp5e morphants by restoring apical PtdIns(4,5)P2 localization and normal ciliogenesis. Phenotypic, cellular, and functional defects of inpp5e morphants can be suppressed by inhibition of PtdIns(3,4,5)P3. In panels (A–F), DMSO-treated inpp5e morphants are on the top and LY294002-treated ones on the bottom. (A) Images of inpp5e morphants at 3 dpf treated with vehicle (DMSO) or 15 μM of LY294002 from 50% epiboly stage. Insets show magnification of glomerulus area. (B) Fluorescent images of pnd region in embryos stained with antibody against ace-Tub and aPKC. (C and D) Images of cross-section of the pnd region of Tg(Tolcdh17:plcd1-gfp) (C) or Tg(Tolcdh17:akt1-gfp) transgenic zebrafish embryos stained with antibody against aPKC. Yellow dotted circles indicate pnd region and white arrowhead indicates mislocalization of PtdIns(3,4,5)P3/PH-Akt1-GFP to the apical membrane. (E) Images of pnd region in embryos stained with antibody against Ezrin and Cdh17. (F) Fluorescent images of heart region of embryos at 5 hours (left column) or 2 days (right column) post injection of FITC-Dextran. (G) Bar graph shows the percentage of kidney cyst formation (N=3, n=20), cilia malformation (N=3, n=20), apical localization of PtdIns(4,5)P2 (indicated by PH-Plcd1-GFP) (N=2, n≥33 cells from 7 embryos), of PtdIns(3,4,5)P3 (PH-Akt1-GFP) (n=3, n≥50 cells from seven embryos), of ezrin (n=2, n≥15), and fluorescent density in inpp5e morphants with (white column) or without LY294002 treatments (black column) (N=3, n≥10). (H) Bar graph shows the percentage of cyst formation in embryos injected with mRNA or MOs as indicated. Overexpression of dnPI3K mRNA significantly suppresses cyst formation in inpp5e morphants (N=3, n≥61). Overexpression of 125 pg PI3KCAAX mRNA significantly exaggerates cyst formation in inpp5e morphants (N=3, n≥87). Overexpression of 500 pg PI3KCAAX mRNA causes cyst formation (N=2, n≥100). (I) Model for the mechanism of Inpp5e in ciliogenesis. Apical localized Inpp5e hydrolyzes PtdIns(3,4,5)P3 to maintain apical PtdIns(4,5)P2 and further sequentially recruits ezrin, F-actin, and basal bodies to apical membrane to facilitate ciliogenesis. Error bars, SD; **0.005<p<0.01; ***P<0.005. Scale bar, 10 μm. To confirm that the rescue effect of LY294002 in inpp5e morphants is indeed through inhibition of PI3K, we overexpressed dnPI3K, a dominant negative, kinase-dead form of the catalytic p110β subunit of PI3K,36 and found that it suppressed cyst formation in inpp5e morphants (Figure 4H). On the contrary, overexpressing PI3KCAAX, a membrane-anchored, active form of the catalytic p110α subunit of PI3K, exaggerated cyst formation in embryos injected with subphenotypic dose of inpp5e MO.36 Furthermore, overexpressing 500 pg PI3KCAAX mRNA resulted in cyst formation (Figure 4H). Moreover, as GFP tagged p75 neurotrophin receptor, p75-GFP, was mainly localized to the apical membrane in the pronephric duct as in MDCK cells,37 we overexpressed apically targeted PtdIns(3,4,5)P3 phosphatase, p75-Pten, and found that it also inhibited cyst formation in inpp5e morphants (Supplemental Figure 12). Taken together, decreasing PtdIns(3,4,5)P3 suppressed cyst formation in inpp5e morphants. To assess kidney function, we measured the GFR in zebrafish embryos by monitoring fluorescence intensities after injecting FITC-conjugated dextran.38,39 As FITC-conjugated dextran was filtered and excreted via the pronephric duct, the intensity of fluorescence declined over time and was almost undetectable 2 days post injection (dpi) in ctrl morphants (Supplemental Figure 11D). In inpp5e morphants, at 2 dpi of FITC-conjugated dextran, the ratio of strong fluorescence was greatly decreased in the LY294002-treated group compared with those in the control group (Figure 4, F–G), indicating that kidney function was restored by LY294002 treatment. Thus, decreasing PtdIns(3,4,5)P3 rescued cellular, phenotypic, and functional defects in inpp5e morphants. Cilia play important roles in development and disease, especially in polycystic kidney disease.1 Unlike other symptoms, cystic kidney is a common hallmark of various ciliopathies, supporting the central role of cilia in polycystic kidney disease.40 Here, to our knowledge, we provide the first evidence that Inpp5e influences ciliogenesis and cystogenesis by regulating apical docking of basal bodies and cell polarity through maintaining apical segregation of PtdIns(4,5)P2 and PtdIns(3,4,5)P3 (Figure 4I). 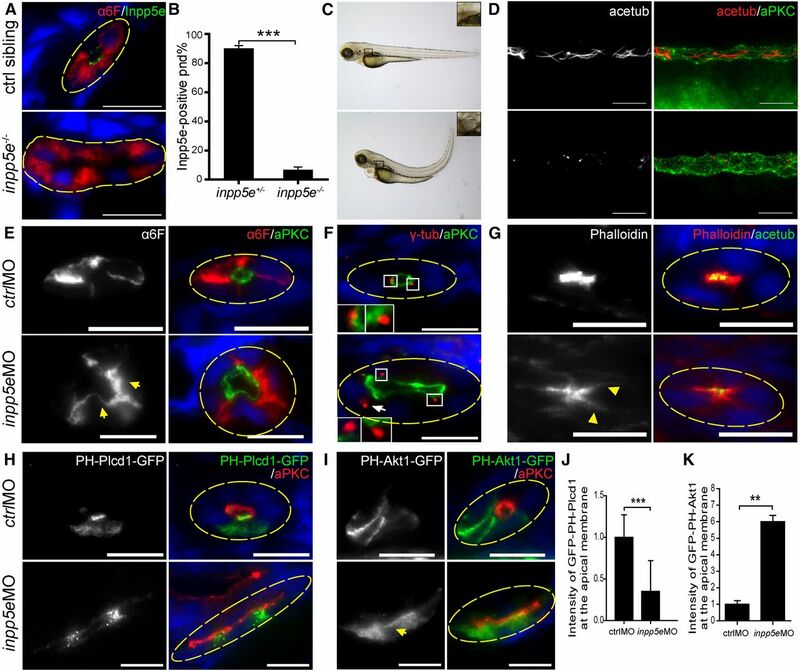 Interestingly, a spatially restricted endosomal PtdIns3P or ciliary PtdIns4P or basal body enriched PtdIns4P is important for cilia assembly or maintenance.41,42 Combined, these data suggest that different spatially restricted phosphoinositides play important roles in cilia morphology and function. Here, we show that Inpp5e is required for ciliogenesis in vivo. 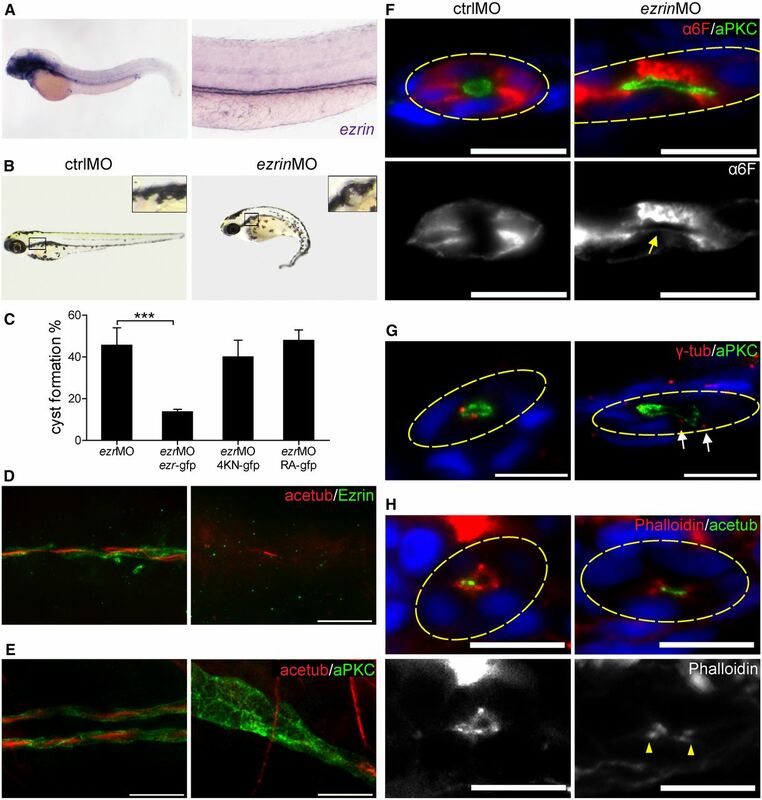 Depletion of inpp5e in zebrafish shows very few or malformed cilia in the pnd at a very early stage. Consistently, in Inpp5eΔ/Δ mice, cilia are malformed and cilia number is greatly reduced in cyst-lining renal epithelium4, indicating significant defects in cilia assembly or stability or both. The differences between different model systems suggest that the role of Inpp5e in ciliogenesis is cell context dependent. Our data suggest that Inpp5e is localized to the apical membrane of pronephric epithelium in zebrafish embryos, although previous studies have shown that Inpp5e is localized to cilia in mammalian kidney epithelium and neural cells.3,4,43–45 Interestingly, we also observed ciliary localization of Inpp5e in epithelium from neural tube or adult kidney in zebrafish, indicating that the localization of Inpp5e is both spatially and temporally regulated. While ciliary Inpp5e is required for hydrolysis of PtdIns(4,5)P2 in cilia and subsequently activation of the SHH pathway,45,46 apical Inpp5e functions outside of cilia to regulate PtdIns(3,4,5)P3. Consistently, Inpp5e−/− cells show an increased level of phosphorylated AKT, which is due to elevated PtdIns(3,4,5)P3 that was undetected in cilia, indicating that INPP5E regulates PtdIns(3,4,5)P3 outside of cilia.44,45 Thus, our observations provide possible mechanisms by which INPP5E regulates PtdIns(3,4,5)P3 at the apical membrane. In addition, our data suggest that apically localized Inpp5e mainly hydrolyzes PtdIns(3,4,5)P3 but not PtdIns(4,5)P2, as only PtdIns(3,4,5)P3 is increased at the apical membrane after knockdown of inpp5e. Several other studies also show that INPP5E hydrolyzes PtdIns(3,4,5)P3 but not PtdIns(4,5)P2 in vitro.47,48 Consistently, Bielas et al. show that some INPP5E mutant alleles from patients, including INPP5E-R378C, lose 5-phosphotase activity toward PtdIns(3,4,5)P3 but not PtdIns(4,5)P2,3 indicating that hydrolysis of PtdIns(4,5)P2 is insufficient for the normal function of INPP5E in humans. Furthermore, overexpression of INPP5E-R378C-gfp failed to rescue inpp5e morphants. In addition, the PI3K inhibitor LY294002, which decreases PtdIns(3,4,5)P3 level, restored cilia stability in Inpp5eΔ/Δ MEF cells,4 indicating that the role of Inpp5e in maintaining cilia is through hydrolyzing PtdIns(3,4,5)P3 in mammals. It remains possible that Inpp5e hydrolyzes PtdIns(4,5)P2 in another compartment of the cell. Interestingly, recent studies show that INPP5E suppresses PtdIns(4,5)P2 in cilia.45,46,49 Together, these results suggest that 5-phosphotase activity toward PtdIns(3,4,5)P3 is required for the function of Inpp5e in ciliogenesis in vivo. In normal pronephric epithelia of zebrafish embryos, PtdIns(3,4,5)P3 is suppressed from the apical membrane by Inpp5e. In inpp5e-depleted epithelia, PtdIns(3,4,5)P3 becomes ectopically localized to the apical membrane and causes relocalization of PI3K to the apical membrane through a positive feedback, which has been observed and proposed before.24,27 Ectopically apical-localized PI3K further converts PtdIns(4,5)P2 into PtdIns(3,4,5)P3 and therefore potentially leads to reduced PtdIns(4,5)P2 at the apical membrane in inpp5e-depleted embryos. Thus, Inpp5e is required for apical segregation of PtdIns(4,5)P2 into PtdIns(3,4,5)P3. Interestingly, Pten is also required for apical segregation of PtdIns(4,5)P2 and PtdIns(3,4,5)P3,25 therefore the role of Pten in ciliogenesis requires further investigation. In conclusion, our findings demonstrate a previously undescribed model in which Inpp5e promotes ciliogenesis by hydrolyzing PtdIns(3,4,5)P3 and stabilizing apical PtdIns(4,5)P2, which in turn sequentially recruits Ezrin, F-actin, and basal bodies to the apical side of renal epithelia (Figure 4I). Thus, we provide a novel mechanism for the function of Inpp5e in ciliogenesis and cystogenesis. It is possible that other ciliopathy genes regulate ciliogenesis by controling the apical segregation of phosphoinositides. In addition, our results for utilizing the PI3K inhibitors may provide new avenues for the development of drug therapies for patients affected by INPP5E mutations and other ciliopathies. Wild-type zebrafish of Tubingen were maintained according to standard protocol.50 Embryos were collected from natural mating and kept at 28.5°C in E3 solution. All MOs, mRNAs, or DNA constructs were injected into embryos at the one-cell stage. For MO injection, antisense MO oligos were synthesized by Genetools. ezrin MO 5′-GATGTAGATGCCGATTCCTCTCGTC-3′ was directed against the 5′UTR of ezrinb.34 inpp5e MO 5′- GCTCACT(CAT)CCTATTGGCGGGCTT -3′ was used to block the translation of inpp5e.6 A standard ctrl MO 5′-CCTCTTACCTCAGTTACA ATTTATA-3′ was used as a negative control. Concentration of MOs used in injection was as follows: 0.25 pmol (full concentration) and 0.125 pmol (subphenotypic concentration) for ezrin MO, 0.75 pmol (full concentration) and 0.125 pmol (subphenotypic concentration) for inpp5e MO. In each injection, full concentration was used unless otherwise stated. For mRNA injection, full-length cDNA of ezrinb (ezrin in the text) and inpp5e was cloned by PCR into a Gateway entry vector. C-terminal HA-tagged ezrin, C-terminal egfp-tagged ezrin, and inpp5e constructs were generated using a Gateway cloning kit.51 Four bp mutations without amino acids changing were introduced at the inpp5e MO binding site (5′-ATGt[A]c[G]c[T]GA a[G]CATGGAGACAG-3′) in inpp5e-gfp to prevent binding of inpp5e MO. Mutant constructs of ezrin were generated via PCR cloning. For PI3KCAAX and dnPI3K mRNA, pCS2-p110CAAX and a pCS2-p110β constructs (obtained from Carl-Philipp Heisenberg) were used as previously described 36. For P75-gfp and P75-PTEN mRNA, P75 was amplified by PCR with EcoRI/XhoI sites from P75-RFP (gift from Kun Ling) and inserted into pCS2-gfp. PTEN was amplified by PCR with XhoI/XbaI sites from a cDNA library from Homo sapiens and inserted into pCS2-P75. mRNA was transcribed in vitro using the mMESSAGE mMACHINE SP6 kit (Ambion) after linearization of constructs with NotI (Takara). For plasmid injection four constructs, Tolcdh17:plcd1-gfp, Tolcdh17:plcd1-mcherry, Tolcdh17:akt1-gfp, and Tolcdh17:btk-gfp, were generated. PH-btk was PCR amplified from a cDNA library from Homo sapiens. PH-plcd1 or PH-akt1 were PCR amplified from PH-plcd1-mcherry or PH-akt1-mcherry (gifts from Chenqi Xu) and cloned into a Gateway entry vector, then with p3Eegfp recombined into ptolcdh17R1R3Dest Gateway destination plasmids, in which cdh17 promoter sequence, a 1.2kb genomic sequence upstream of the start codon as previously described,52 and attR1-R3 replaced original fli1a promoter sequences and attR1-R2 in ptolfli1epDest53 (gift from Nathan Lawson), respectively. Tol2 transposase was coinjected with plasmid DNA. Transgenic fish Tg(Tolcdh17:plcd1-gfp) and Tg(Tolcdh17:plcd1-mcherry) were generated by subsequent screening of GFP or mCherry positive fish. 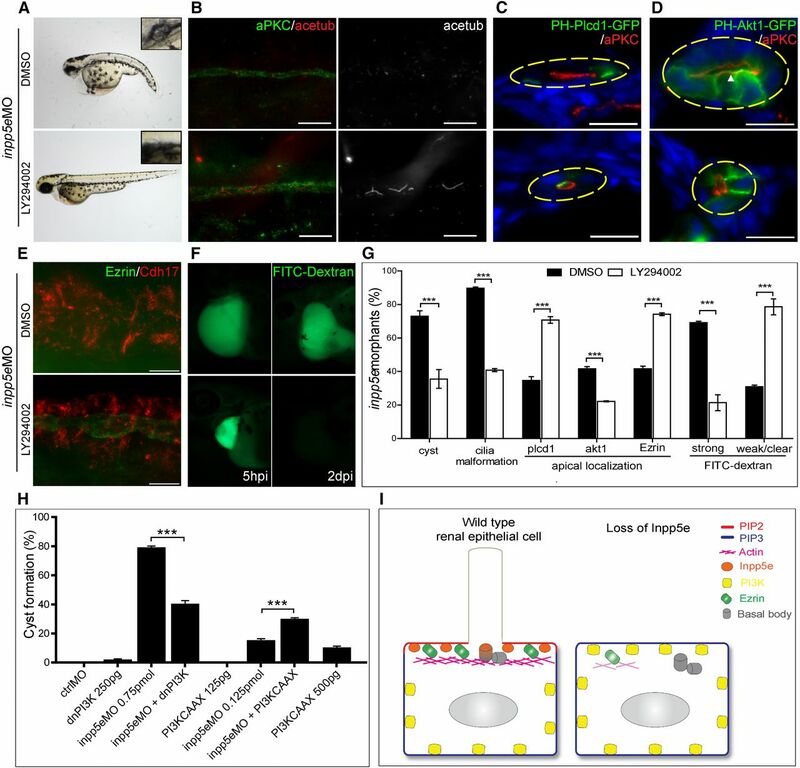 Generation of zebrafish mutants using the CRISPR/Cas9 system was carried out as previously described.18 Briefly, Cas9 mRNA was in vitro transcribed from a previously reported construct.18 For Inpp5e, a gRNA was chosen to target the middle region (exon 4) in the inpp5e locus. The gRNA targeting sequence is as follows: 5′-GATGCTGTATGCAGCAGCCCA(TGG)-3′. For pik3ca/p110α, three gRNAs were chosen to target the anterior region (exon 4) and middle regions (exon 9 and 10) in the pik3ca locus. The gRNA targeting sequences are as follows: g1: 5′-GACACTAGAGTGCCTCCGGG(AGG)-3′, g2: 5′-GACAGAGACGAGCCGCCCGG(GGG)-3′, and g3: 5′-GAGCACTGTCCACTGGCCTG(GGG)-3′. Both Cas9 mRNA and gRNA were injected into zebrafish embryos and mutagenesis efficiency was estimated by PCR, amplifying the target sequence from DNA lysate of injected embryos followed by restriction enzyme digestion (StyI for inpp5e target, MspI for p110α g1 and g2 targets, BstXI for p110α g3 target). For inpp5e mutagenesis, injected embryos were raised to adulthood and outcrossed to wild-type fish. Positive carrier or founder fish F0 were identified by genotyping the offspring embryos from the outcrosses and F1 were raised. Positive F1fish were crossed to each other to get homozygous mutant embryos. Whole-mount in situ hybridization was performed as previously described.54 Antisense probes for ezrin and inpp5e were made with digoxigenin-labeled UTPs (Roche, Basel, Switzerland) using constructs linearized with BamHI or ApaI as templates for RNA synthesis with T7 RNA polymerases. Antisense probes for nbc1 (gift from Iain A. Drummond), foxj1a, and foxj1b (gifts from Anming Meng) were prepared as described previously.55,56 The stained embryos were dehydrated in glycerol and photographed with a Nikon SMZ1500 stereomicroscope (Nikon, Tokyo, Japan). For antibody staining, embryos or adult kidneys were fixed in cold Dent fixative (80% methanol: 20% dimethyl sulfoxide) at −20°C overnight and then stored in methanol. Samples were permeabilized with 1 mg/ml Saponin (20 minutes, for Inpp5e antibody) or 0.005% (m/v) trypsin (10 minutes, for all the other primary antibodies) in PBST (PBS with 0.1% Triton X-100). Samples were blocked with blocking buffer (5% [m/v] BSA and 5% [v/v] goat serum in PBST for Inpp5e antibody and 10% goat serum in PBST for all the others), and incubated with primary antibodies in blocking buffer. Primary antibodies were recognized by secondary antibodies conjugated with Alexa Fluor 488 or Alexa Fluor 568 (Invitrogen, Carlsbad, CA). Samples were mounted on ProLong Gold Antifade Mountant with DAPI (Invitrogen) and images were taken with a Nikon eclipse 80i fluorescent microscope. Polyclonal rabbit antibody to Ezrin was raised against an 18-amino acid synthetic peptide (KRREAIEREKEQMEREKC). Cdh17 antibody was raised against two different amino acid synthetic peptides (QDVNDNYPKLQKT and CPFTFAISRKSQ NFEIKP) (Biomed). The antibody was affinity purified on antigen peptide-conjugated beads (Pierce Chemical). Primary antibodies were diluted in blocking buffer at the following concentrations: anti-INPP5E(1:200, Proteintech); anti-HA(1:100, Santa Cruz Biotechnology, Santa Cruz, CA); anti-GFP (1:500, Roche); anti-α6F (1:100, Developmental Studies Hybridoma Bank); anti–acetylated tubulin (1:2000; Sigma-Aldrich, St. Louis, MO); anti–γ-tubulin (1:100, Sigma); anti-aPKCζ (1:200; Santa Cruz); anti-Cdh17 (1:300); anti-Ezrin (1:100); anti-p110α (1:100, Cell Signaling Technology, Danvers, MA). For phalloidin (1:500, Invitrogen) staining, the embryos were fixed in 4% formalin overnight at 4°C, and permeabilized in ice-cold acetone for 7 minutes at −20°C. Alexa-conjugated secondary antibodies (Invitrogen) were used at 1:500 dilutions. Sequential double staining using two rabbit antibodies, Ezrin and Cdh17, was performed to prevent secondary antibody cross-reactivity as described.57 Briefly, Ezrin antibody was applied first and stained with the Alexa 488 antirabbit antibody. Cdh17 antibody was sequentially applied and stained with Alexa 594 antirabbit antibody. For frozen sections staining, prior to cryo-embedding, the fixed embryos or adult kidneys were incubated sequentially in 10% (w/v) sucrose (10 minutes, room temperature), 20% (w/v) sucrose (30 minutes, room temperature), and 30% (w/v) sucrose (overnight, 4°C). Embryos were then transferred to OCT (Sakura Finetek, Inc., Torrance, CA), frozen in molds using dry ice, and then sectioned (10 µm) using a CM1950 cryotome (Leica Microsystems, Buffalo Grove, IL). The sections were collected on Superfrost Plus slides (Fisher Scientific, Waltham, MA) and stained with specific primary and secondary antibodies. For total lysate, embryos were deyolked and homogenized in the SDS sample buffer, boiled for 5 minutes, and cleared by centrifugation at top speed for 5 minutes. For immunoprecipitation, embryo lysates were prepared in TG buffer (PBS with 0.1% Triton X-100, 1% glycerol). Lysates were then incubated at 4°C with Myc antibody (Abgent) followed by protein A beads (Roche). Beads were washed in the TG buffer, and precipitated proteins were analyzed by SDS/PAGE and Western blotting following standard protocols. Total RNA was extracted from embryos injected with ctrl MO or inpp5eMO using RNAiso Plus (Takara, Kyoto, Japan) and cDNA were synthesized by Reverse Transcriptase M-MLV (Takara). Real-time quantitative PCR was performed using FastStart Universal SYBR Master (Roche) in an Applied Biosystems ViiA7 system (Life Technologies, Carlsbad, CA). Embryos were treated with 15 μM LY294002 (Calbiochem, San Diego, CA) in 1% DMSO starting at the 50% epiboly stage forward. Vehicle-treated control embryos were treated with 1% DMSO. FITC-conjugated dextran (40kD) was injected into the cardinal vein of living 3-dpf old embryos38,39 and fluorescent images were taken 5 hours post injection and 2 dpi in the same conditions using a Nikon eclipse 80i fluorescent microscope. Microsoft Excel (Microsoft, Redmond, WA) was used to derive SD and t tests. In all analyses, N means the number of independent experiments and n means the sample size, usually the number of embryos used, in each experimental group, unless otherwise stated. In all bar graphs, *0.01<p<0.05; **0.005<p<0.01; ***P<0.005. Zebrafish care and experiments were approved by the Institutional Animal Care and Use Committee of Tongji University. We thank Dr. Chenqi Xu, Dr. Carl-Philipp Heisenberg, Dr. Anming Meng, Dr. Nathan Lawson, and Dr. Kun Ling for the kind gifts of the constructs. We thank Dr. Zhaoxia Sun and Dr. Jinghua Hu for critical reading of the manuscript, the members of the Cao lab and members of Tongji-Changzheng Joint Research Center for Translational Medicine for helpful discussions, and Yuqing Feng and Jiangfang Liu for superb technical assistance. This project was supported by grants from the National Basic Research Program of China (973 Program 2012CB966601 and 2013CB945300), the Ministry of Science and Technology of China (2011DFB30010), the National Natural Science Foundation of China (31171412), and the Shanghai Municipal Science and Technology Commission (11PJ1409100). This article contains supplemental material online at http://jasn.asnjournals.org/lookup/suppl/doi:10.1681/ASN.2015080906/-/DCSupplemental.